Belle de Couture: Off The Shoulder + 2 Giveaways!! Off The Shoulder + 2 Giveaways!! Happy hump day lovelies! I have 2 rad giveaways for y'all today! 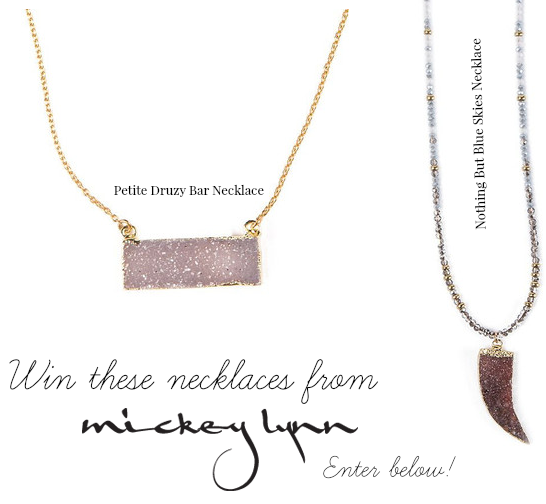 Enter to win this off-the-shoulder lace dress from April Marin and/or these beautiful druzy necklaces from Mickey Lynn! These pieces are perfect for spring and summer! This dress can be dressed up or down, and even used as a swimsuit cover-up! Wear it belted like I did, or non belted as seen here. I love layering these two Mickey Lynn necklaces together, but they are just as beautiful worn alone. P.S. The weather is still rainy and overcast in Myrtle Beach, but we're making the best of it! Giveaways open to US only. Enter via the individual Rafflecopters below! Giveaways will end and winner's will be chosen randomly on April 23, 2015. Looking so beautiful and boho chic in this outfit! Your bag and sandals are perfect. That dress and bag is so unique. Love the bright colors of your outfit. So, so, so amazingly beautiful! I love the bare shoulder trend, this dress is so fun!